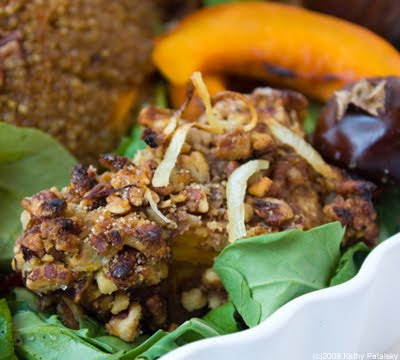 5 Step Pumpkin Platter: Thanksgiving Vegan Protein. New Traditions. To me, Thanksgiving is all about gathering family to feast on traditional festive foods. However, I strongly believe that 'tradition' needs a bit of graceful updating once in a while. By 'veganizing' my Thanksgiving I am forging a new trail of tradition. However, I keep my Thanksgiving menu vegan and traditional simply by staying in tune with delicious fall harvest flavors. Yes, this Pumpkin Platter is intensive, but the results are well worth it - if you have the time, energy and heart to make it. Step One: Golden Orchard Cider Spiced Quinoa. *You can choose one or both of the tofu/tempeh ingredient options. 1 package tempeh, 8 oz. 3/4 package firm tofu, 8 oz. 1. Pre-soak your proteins in your apple cider/soy sauce mixture. Half cider, half soy sauce. You can soak them overnight if you'd like - but at least for 20 minutes. Set aside. 2. Prepare your candied onion garnish by thinly slicing your onion and coating the strands in a mixture of oil and sugar. Spread then thin on a baking sheet and roast them in the oven on broil for 5-7 minutes. When the onions are caramelized, browned and crisp (but not burnt) remove them and set them aside to cool. Turn the oven to high to preheat at 400 degrees for the remaining portion of your platter components. 3. Start your pumpkin sauce on the stove over medium heat. Add to a soup pot all the pumpkin sauce ingredients. Stir briskly until well combined. Bring to a simmer. Cover. let simmer on low-med heat while you prepare your protein triangles. 4. In a saute pan add 1 Tbsp of oil. Lightly saute your well-soaked protein triangles so that you get a nice browning on either side and they are cooked through. The tofu should firm up quite a bit and be more handle-able. You can even add a few teaspoons of the soy/apple cider mixture to help braise the proteins. Set aside on a paper towel to cool. Tip: Saute your proteins so that they are tasty enough to eat 'as-is'. For optimal flavor and texture, you don't want to use raw tofu or tempeh for your dipping/coating process. 5. Check on your sauce and stir it every few minutes so that it doesn't burn. You can uncover it to let some steam off and allow the sauce to 'cook down' a bit. Keep an eye on it as you continue working on your other ingredients. 6. Prepare your nuts (Pecans or Almonds) by splitting them into two portions: With the first portion you will hand crush them into roughly chopped/smashed bits. The second portion you can puree in a mini-food processor until they come out as 'nut meal'. You can also buy almond or pecan 'meal' at the store. Combine both portions of nuts and disperse them in a shallow tray. Set aside. 7. Get a second shallow tray or plate and disperse your whole wheat flour, pinch of salt and sugar. These trays will be used in the coating process of your protein. 8. Check on your pumpkin sauce. It should be thick, yet creamy. Do a taste test. It should be sweet and tart yet savory and smooth. The pumpkin flavor will shine through as the dominant flavor. If you'd like to play around with adding in additional spices or herbs, go ahead. This pumpkin base is perfect for adding your own flavor touches if you enjoy 'getting creative' in the kitchen. Remove the finished sauce from the stove and let it cool for a few minutes. 9. 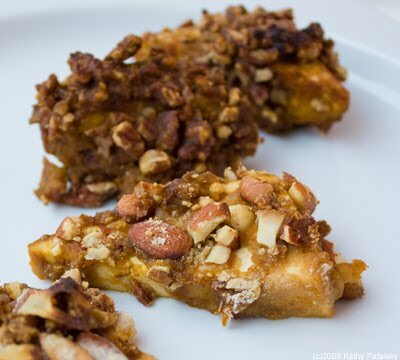 Start coating your sauteed and cooled triangles with the pumpkin and nuts. There are two ways to coat your protein. The first way is to simply lay all the triangles flat in a baking dish. Then cover them all in pumpkin sauce and sprinkle a thin layer of flour, then a thick layer of the nuts over top that. (This method doesn't need 'trays'.) The second way is to do a basic dipping coating method. Dunk your protein in the pumpkin sauce, transfer the wet protein to the flour tray, coat. Then dip in the nut mix tray. 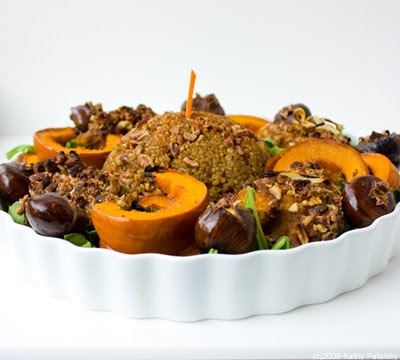 The second method can get a bit messy, but it will allow for all sides to be coated in pumpkin and nuts. Continue this process until all the triangles are coated and laying in your baking tray. You can even pour a bit of extra sauce over top and sprinkle with the extra nuts/nut meal if you'd like. Otherwise, you can save the extra pumpkin sauce as a sort of pumpkin gravy for the table. 10. Cover your baking dish with foil and place in the 400 degree oven to bake for 20 minutes. For the last 5 minutes of baking time, uncover and place under broil heat-this will crisp and brown the nut crust. However if you are using tempeh, you must be careful to not 'dry out' the protein. Tofu may require a few more minutes under the broiler because of its moister texture as opposed to the firm tempeh. 11. Remove from the oven and allow to cool for 5 minutes before plating. Garnish with your candied onion strands. To Make: Clean and halve a sugar pumpkin. Remove seed pulp. Sugar pumpkins are smaller, sweeter, less grainy and lighter in weight than traditional large pumpkins. If you can't find a sugar pumpkin, you can use another sweet winter squash, or add a bit more sugar to a traditional pumpkin. Coat the flesh of each half with a bit of olive oil, maple syrup and brown sugar. Add a dash of sea salt. The oil/sugar mixture should create a nice pool in the center where you scooped out the seeds. This pool will dry out and marinate the flesh during the cooking process. Place the pumpkin on a baking sheet, flesh side up, and transfer to a 400 degree oven to roast until tender. Usually about 30 minutes-depending on size and how 'crowded' your oven may be. Remove the roasted pumpkin from the oven and slice into 1/2"-3/4" thick slivers, place back on baking sheet, re-coat in oil/maple/sugar/salt and place back in oven, under the broiler for an additional 5-7 minutes. 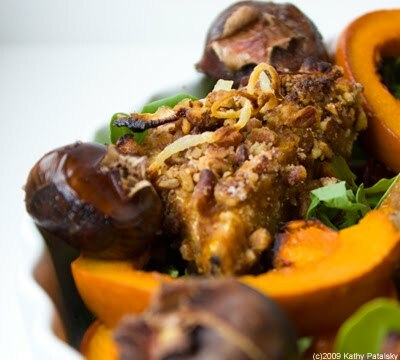 When finished, your pumpkin slices should be browned, caramelized, super tender and tasty. You will plate the pumpkin skin-on because it should easily pull away from the tender edible flesh. Set your slices aside to cool a bit before plating. To Make: Wash and dry about a cup of whole chestnuts. Shell on. Slice a medium sized "X" in each of the nut shells. Coat nuts in oil and a bit of salt. Roast in a 400 degree oven for about 20-30 minutes, or until the "x" marks burst open and the insides become tender. You will need to peel a few while they are still warm, but you can also leave a few unpeeled for pretty garnish. (You can peel then hot or cold, but it is much easier to peel them when they are still warm and the shell is soft.) Set aside. 1. Arrange a bed of arugula on a platter. 2. 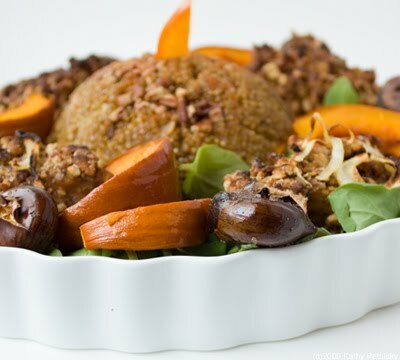 Carefully transfer your quinoa dome onto the center of the platter. Garnish your dome with a pointed fuyu persimmon slice. 3. Carefully transfer your triangle proteins to the platter. 4. Next, layer a few pumpkin slices around the platter - in between each of the protein triangles. 5. Lastly, dot the edges of the platter with the warm chestnuts. 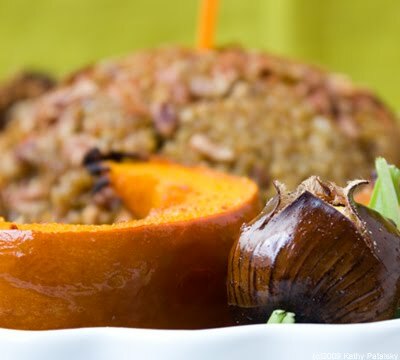 You can also add a few peeled roasted chestnuts for easy-easting purposes. You can also add a few dried cranberries if you'd like more color. 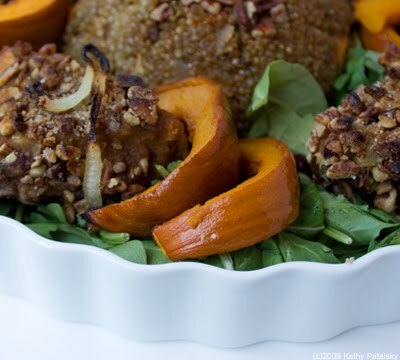 Serve and feast on your pumpkin platter! 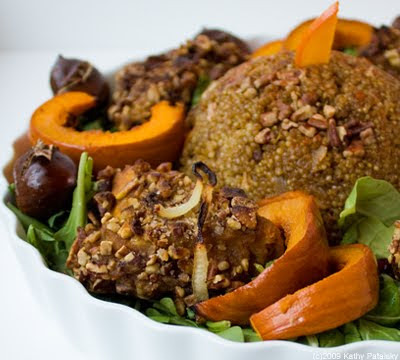 Certainly worthy to be a centerpiece dish at your vegan Thanksgiving table.